Ledbury Poetry Salon featured poet Cliff Yates on Wednesday 8 June in the Panelled Room at The Master’s House in Ledbury. Cliff Yates was born in Birmingham. He left school at sixteen and did a variety of jobs before returning to full-time education. He won both the Aldeburgh First Collection prize and the Poetry Business Book & Pamphlet Competition with Henry’s Clock. He read from and chatted about his new collection Jam, as well as poems from previous collections. Jamis a various and expansive collection. There are love poems and elegies, poems about childhood, friendship and bike rides in the rain. A record collection is set on fire, ‘Kevin’ learns to breathe above water, a chicken lives on someone’s head and a boat appears in the sky. The work combines technical assurance with ambition and playfulness to challenge preconceptions. The poems are moving, surprising and funny, sometimes in the space of a few lines. Cliff Yates is a former English teacher whose students were renowned for winning poetry competitions. He wrote Jumpstart Poetry in the Secondary School (Poetry Society, 1999) during his time as Poetry Society poet-in-residence. 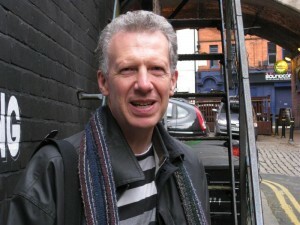 He is a tutor for the Arvon Foundation and is currently Royal Literary Fund Fellow at Aston University.